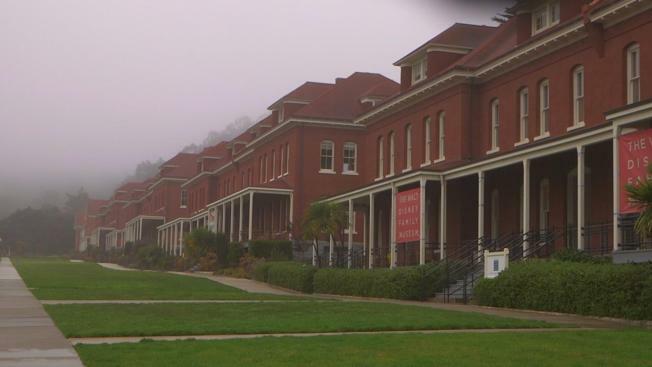 In its roughly 250-year lifespan, San Francisco’s Presidio has been home to many things — a Spanish settlement, a military post and even a bowling alley. But now it’s about to get something it's never had before — a visitor center. On Thursday, Congresswoman Nancy Pelosi, a champion of the Presidio’s post-to-park conversion, will cut the ribbon on the new William Penn Mott Jr. Presidio Visitor’s center — a sort of high-tech waypoint intended to orient visitors trying to unravel the diverse and somewhat mysterious 1,500-acre park. The building that houses the sleek new center is vastly transformed from its original use — a military jail. But in a nod to its previous identity, the trust left the bars on the windows — although comings and goings are now strictly optional. Inside the new Presidio Visitor Center, an array of fog lights pay homage to the Golden Gate region of the park. The new center is equipped with an interactive touch mapping table that allows people to virtually navigate around the park and learn about its history. Another touch table allows people to access the park’s history through photographs and blurbs. A large light board lists a schedule of events taking place in the Presidio along with links to transit services and the park’s burgeoning restaurant scene. The Presidio is a smorgasbord of scenery — from the jaw-dropping bay views of Crissy Field to thick forests to the recently restored original Officer’s Club — which is among San Francisco's two oldest buildings (there’s an ongoing debate with Mission Dolores). The park is also home to the Walt Disney Museum, a new history museum and more than 400 buildings on the National Historic Register. Still, for many visitors, there is some head-scratching as to what the Presidio is and what you’re exactly supposed to do there. Congresswoman Nancy Pelosi will dedicate the Presidio's new William Penn Mott Jr. Visitor Center on Wednesday, Feb. 22. The center is intended to help demystify the park for visitors. The visitor center is divided into the sectors of the park — a decorative arrangement of bugles hangs in the section devoted to the old military post; a wall of fog lights marks the Golden Gate region; and eucalyptus leaves covered in butterflies signify the woody southern end of the park. In the rear of the building, windows open to expansive views of the bay and an area of the park in transition. Caltrans recently completed a pair of traffic tunnels on what was once Doyle Drive. Later this year, the agency will turn the land over to the Presidio, which will begin constructing a 14-acre park on tunnel tops, connecting the upper area to the Bay for the first time in decades. Fraser said the project is expected to break ground this year and reach completion sometime in 2019. The prospect of yet another facet to the park would only emphasize the need for a visitor center, as well as cement the Presidio’s image as a resource constantly being shaped and molded — even hundreds of years after its first settlement. “We hope this project goes on really forever,” Fraser said eyeing the view. **The Presidio will hold a community grand opening for the center on Saturday February 25th from 10am to 4pm. A series of interactive boards help visitors navigate through the Presidio and learn about its history.